Hard to believe that it was a little over 2 years back when I thought of selling the hair oil I had formulated and launched a new cosmetic brand – Satthwa. Within the last 2 years, we launched a few essential oils and jojoba oil but I always wanted to launch a shampoo which would complement our hair oil. Once of the biggest challenge is this line of work is, finding the right manufacturing partner. This is one of the major reasons why I could not launch shampoo much before, another reason is that with every product which we launch, we want to be 100% sure of its efficacy. I see no point in launching products if they do not solve a problem. Over the years, people have started moving away from applying cosmetics for the sake of applying to applying to solve an issue. In the case of shampoo, from day one, we recommended people use our hair oil with a sulfate / paraben free shampoo, which meant that when we launched our own shampoo, not only does it need to be SLS / paraben free but it also needs to have additional qualities which help your scalp and hair. The research on our shampoo, it literally took six months. We wanted to include some premium oils into the shampoo as well, Argan oil, Avocado Oil, Botanical Keratin etc, these all have restorative and healing properties for scalp. I have seen other brands launch 10 new products in 6 months time frame and here we were still researching on just one! Never the less, we launched the Satthwa argan oil shampoo almost a month back and the feedback has been amazing on it. Not just our friends and family loved it but we got super unbiased feedback from the blogger community as well. 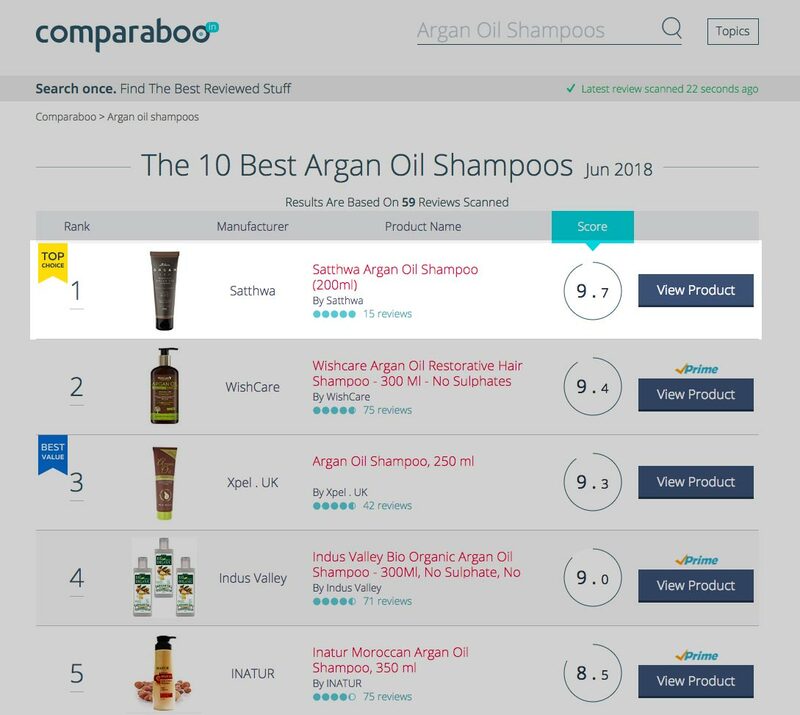 Just today when I was doing my usual research, I happened to come upon a website and was pleasantly surprised to see that our shampoo is has got the #1 spot for the best argan oil shampoos in India. Feels good to know that our hard work is paying off!